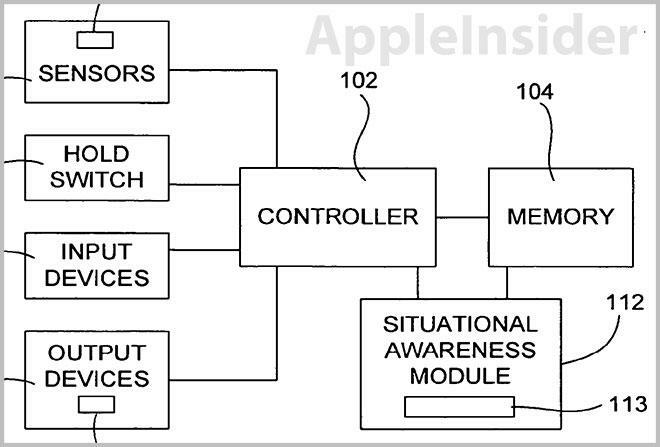 A system outlined in an Apple patent on Tuesday takes data from a number of sensors deployed throughout a handheld device and feeds the information into a "situational awareness module," which then triggers a number of functions, including vibration settings, music playback and sleep mode. Apple's U.S. Patent No. 8,385,039 for "Electronic device with automatic mode switching" joins a variety of existing and pending properties related to sensor management to create a highly automated system that can "anticipate" a user's needs. By using temperature, force, ambient lighting, vibration, pressure and a multitude of other sensors, Apple's "intuitive portable electronic device" can predict what function a user is likely to perform next. For example, the device can change be awoken from sleep mode based on ambient light and orientation information without input from the user. This provides for a heightened user experience. Illustration of the patent's original implementation as it applied to a concept iPod hold button. The portable electronic device is therefore ready to perform a user function when the user desires to perform the function. The user does not have to perform additional steps such as selecting menu options in a GUI or activating a button or switch. While the patent language and illustrations point to a portable media player, specifically the click wheel iPod, modifications have been made to the property's language to include cellular handsets like Apple's iPhone. Such products are mentioned in relation to how a user handles a device, for example two-handed use when texting or one-handed when placing a call. In operation, the collected sensor data is run through a "situational awareness module" that interprets the signals by applying them to so-called "truth tables." 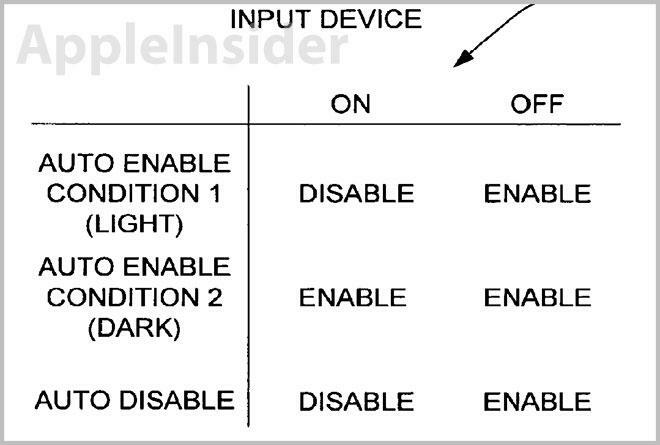 These tables are used to map particular sensor events to functions, such as those gathered when a user adjusts volume levels, which then serve as "examples" of how a set of inputs should be handled in the future. The system can be directly customizable, allowing the user to set sensor parameters and what functions they trigger. Illustration of sensor truth table. The patent covers a litany of implementations, including playing songs based on how a user takes the device out of their pants, switching between ring and vibrate modes based on ambient light and adjusting volume based on ambient noise. The patent was first filed for in 2011 and credits Fletcher R. Rothkopf as its inventor.